The chaotic rebuilding effort has actually widened the country’s social rifts, bringing the first emancipated black Republic under the yoke of a new kind of imperialism. Elsewhere on the island, tens of thousands had yet to emerge from the ruins of the 2010 earthquake and were clustered in makeshift encampments, still frozen in the aftermath of the catastrophe. It was on behalf of these Haitians that human rights activist Antonal Mortime paid a visit to Washington, DC, the same week that the AmCham shmoozed in the Haitian capital. In collaboration with the American Jewish World Service, he came to tell US activists that Western aid efforts had harmed far more than they had helped. More than four years since Haiti was flooded by aid money, the chaotic rebuilding effort has widened the country’s social rifts, bringing the first emancipated black republic under the yoke of a new kind of imperialism. In an interview with The Nation, Mortime, executive secretary of the Platform of Haitian Human Rights Organizations (POHDH), described the social disaster that had unfolded under the banner of humanitarian aid. The money that has trickled down has been absorbed in large part by a phalanx of NGOs jostling chaotically for international grant money. Despite some good intentions, many of these groups, Mortime argues, have funneled money into ill-planned projects with little oversight or accountability, leading to waste and profiteering that have likely impeded the country’s long-term development. 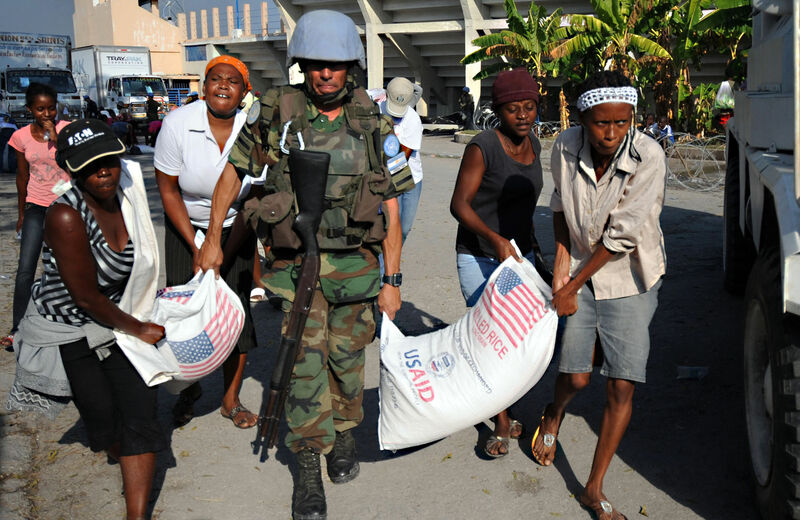 Independent audits have revealed that the groundswell of international assistance efforts, ranging from missionary aid enterprises to ad hoc home building projects, have operated with little coordination, despite efforts by the United Nations OCHR, along with an international coordinating body, the Interim Haiti Recovery Commission, co-chaired by Bill Clinton, to centralize the distribution and deployment of recovery funds. The international “partnerships” have unraveled amid cost overruns and massive mismanagement. And Haiti’s government, historically tethered to streams of foreign aid and debt and cheap export trades, remains saddled with a shattered infrastructure and tattered public services. Today, 100,000 remain “internally displaced”, with ramshackle shanties standing as a sad epitaph to false promises. Faced with a slew of botched projects and profiteering scandals, Congress recently passed legislation aimed at expanding oversight of USAID reconstruction funds and improving coordination with Haitian agencies. Watchdog groups have welcomed the measure, but the damage wrought by past mismanagement may be irrevocable. Many Haitian activists agree that the recovery effort has been dysfunctional but they also view the failures so far as a product of a corrupt international agenda. The women who work inside Caracol have paid the price. A recent report published by POHDH, based on surveys of Caracol workers in late 2013, found that the women garment workers suffer “extremely difficult conditions, inadequate pay and [lack] any form of effective social protection.” They also had minimal union representation and were exposed to wage theft and sexual harassment at work—reflecting a overarching climate of gender-based violence that has roiled through post-quake Haiti. Despite recent minimum wage hikes, garment workers typically earn between $5 and $7 a day, far less than what’s needed to support a family’s basic needs in Port-au-Prince. To Mortime and other activists in Haiti, breaking the country out of the cycle of aid and impoverishment requires a rethinking of the relationship between human rights and economic security. Both US lawmakers and the Haitian government constantly stress the need to bring “security” to Haiti’s streets, citing the prevalence of crime and disorder. But POHDH sees real security as a project of democratic governance, not the brutality and aggression for which Haiti’s current security apparatus is known. Alongside a notoriously corrupt criminal justice system, the UN’s security operation, MINUSTAH, still patrols Haiti’s communities and is widely viewed as an occupying force. The public’s resentment continues to grow as the UN continues to ignore widespread evidence that its troops are responsible for introducing the massive cholera outbreak of 2010 to 2011. A humane approach to public security, Mortime says, begins with strengthening civil society from the ground up. Expanding access to education is key, as is the establishment of an independent judiciary and clean elections as a check on the political ruling class. It seems extraordinary that after witnessing so many disasters, human-made and natural, befall his country, Mortime still has faith that a democratic republic can be raised from the ruins of the quake. But he bears in mind that the country’s whole history is rooted in the people’s resilience through waves of political upheaval and colonial dominion.